“It’s interesting to have so many like-minded people together in one place. I did not know you when I came here, and you did not know me. So, maybe this is why I came here. 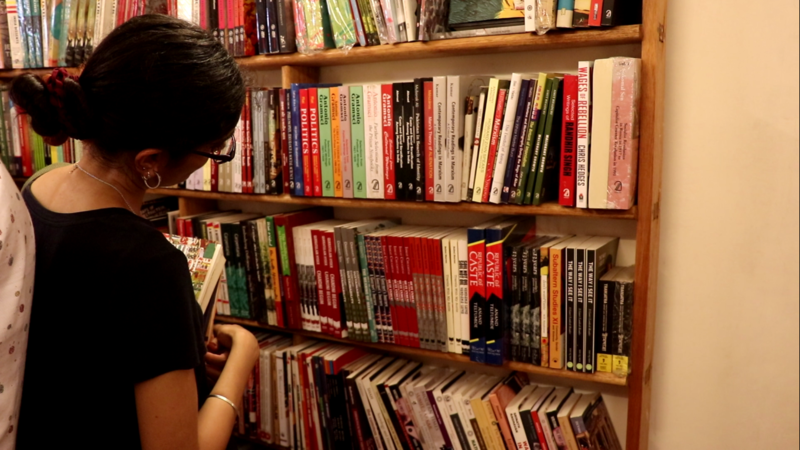 But mostly I just came for the books,” said Abhisheik Shandilya, standing in a shady narrow by-lane of Shadi Khampur, trying to escape the sun. We were in Shadi Khampur, a tightly-packed residential and industrial neighbourhood in West Delhi. A few steps away was the inconspicuous May Day Bookstore & Café, Delhi’s only left-wing bookstore and cafe. While its location is unlikely, it’s not accidental. 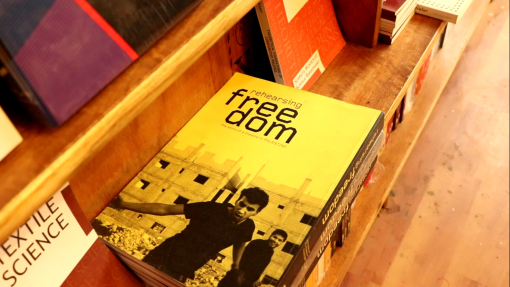 Set up by Leftword Books, the location was chosen consciously because they wanted to work with the people in the neighbourhood. It is not just its location which makes it unique. 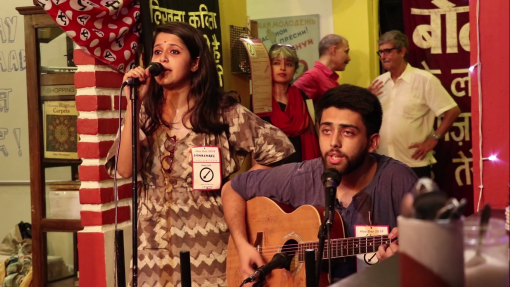 It opens into Studio Safdar, a performance space set up by Jana Natya Manch (Janam). Janam makes sure to invite the locals to every one of their performances. The bookstore also carries titles from other independent publishers. The café runs on the goodwill of its customers, who pay whatever they feel like. “They have book sales throughout the year for the neighbourhood. They hold reading sessions for the kids from this neighbourhood on Sundays. It’s an inclusive space. It’s for the neighbourhood, the community; it’s for the people who live here,” says Ketaki, who is a regular at the bookstore and has been coming here since its inception in 2012. 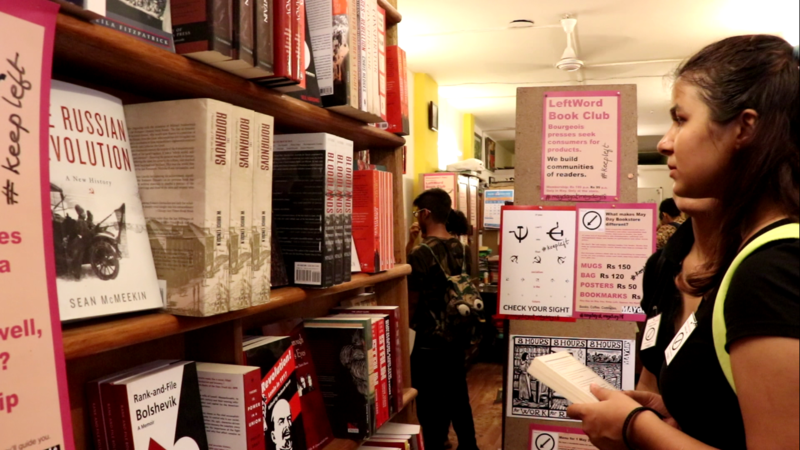 The space is managed by Sudhanva Deshpande — actor, director at Janam, and managing editor at Leftword Books — and his amazing team. 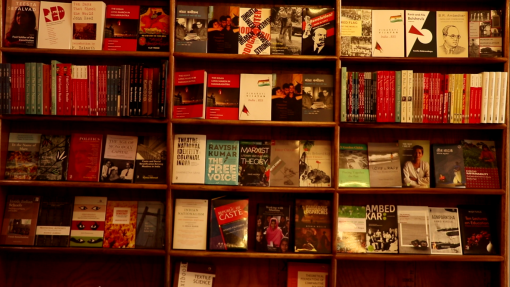 The May Day Bookstore & Café first opened its doors six years ago on 1 May. Since then, it has held a celebration on 1 May every year. 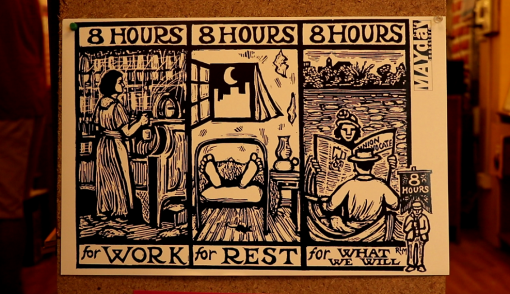 The occasion is not so much to celebrate their anniversary but, more importantly, it is to celebrate and commemorate May Day. 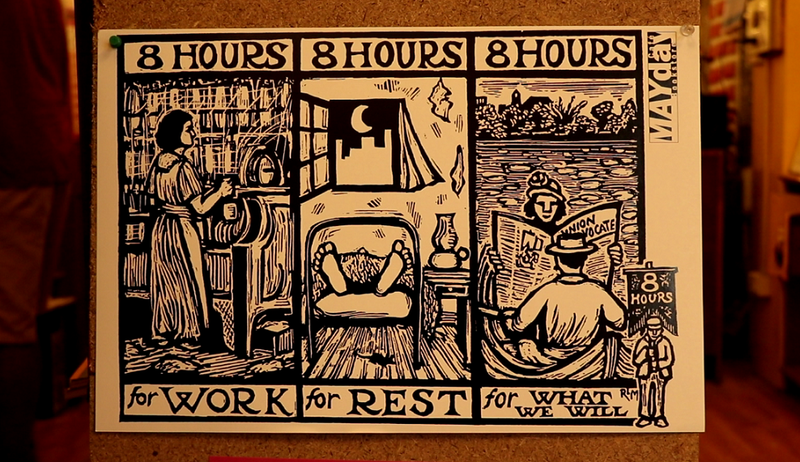 May Day or 1st of May — which originally began as a spring festival and continues to be celebrated as such in some parts of the world — is now also celebrated as Labour Day. …during a speech near the McCormick plant, some two hundred demonstrators joined the steelworkers on the picket line. Beatings with police clubs escalated into rock throwing by the strikers which the police responded to with gunfire. At least two strikers were killed and an unknown number were wounded. Full of rage, a public meeting was called by some of the anarchists for the following day in Haymarket Square to discuss the police brutality. Due to bad weather and short notice, only about 3000 of the tens of thousands of people showed up from the day before. This affair included families with children and the mayor of Chicago himself. Later, the mayor would testify that the crowd remained calm and orderly and that speaker August Spies made "no suggestion… for immediate use of force or violence toward any person…"
Eight anarchists – Albert Parsons, August Spies, Samuel Fielden, Oscar Neebe, Michael Schwab, George Engel, Adolph Fischer and Louis Lingg – were arrested and convicted of murder, though only three were even present at Haymarket and those three were in full view of all when the bombing occurred. 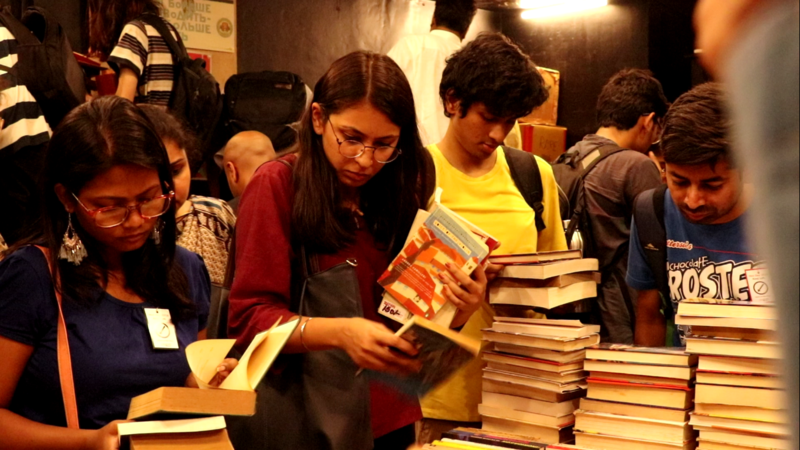 May Day Bookstore & Café celebrates the occasion by organising a massive second-hand book sale and holding various live performances, along with the new books that are available in the bookstore. It is the only day of the year when the items from the café menu are sold at a fixed price. Another crowd puller is the mean coffee that’s available at the café counter, manned by the indefatigable Mukul Manglik. This year, the day began with Mandeep Raikhy and his crew who performed a piece called "Saavdhaan." 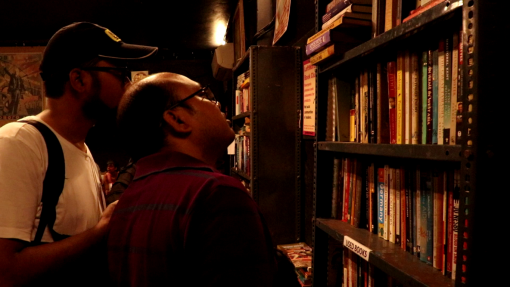 As before, Rahul Ram and Sanjay Rajoura gave live performances. 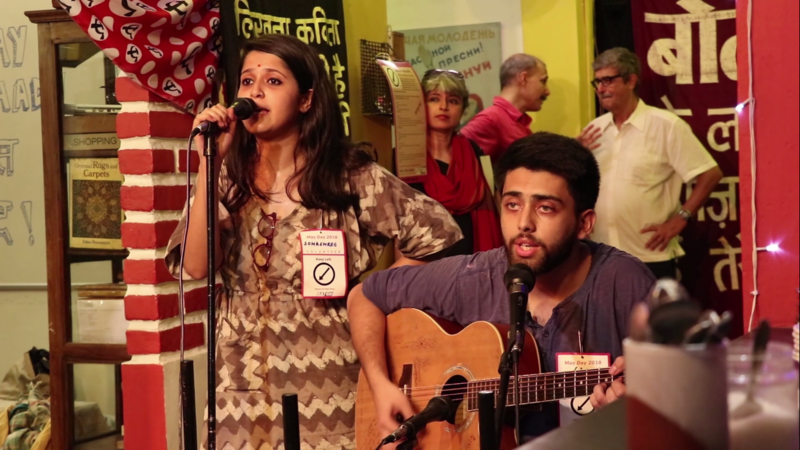 Two students, Soham and Somashree, performed live. They had come from Jadavpur Univeristy, Calcutta, especially for the event. Apart from these, there were performances and readings by Satyam Tiwari, Sumangala Damodaran, Raza Haider, Arundhati Ghosh, Srabani Chakraborty, and Mukul Manglik. Keith Goyden and Vasant Saberwal took charge of the café, preparing the baked goods that were on the menu for the day. 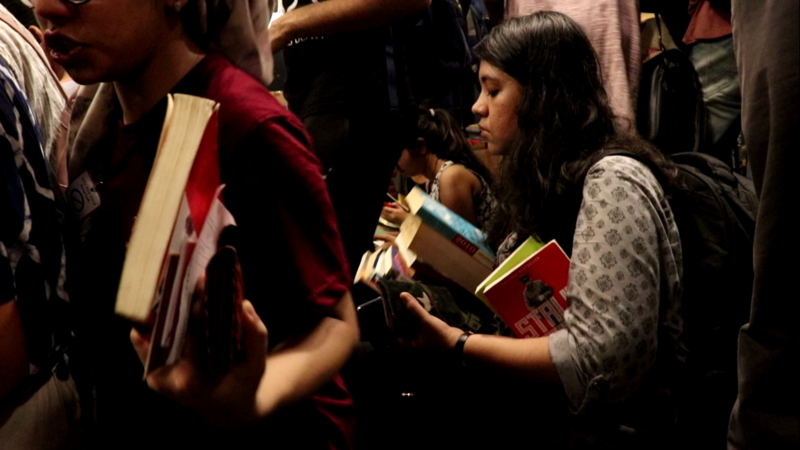 The popularity of the book sale was evident from the fact that Studio Safdar, where the book sale was happening, had a tightly packed crowd practically throughout the day. The crowd only started thinning about 7 hours after the sale began. 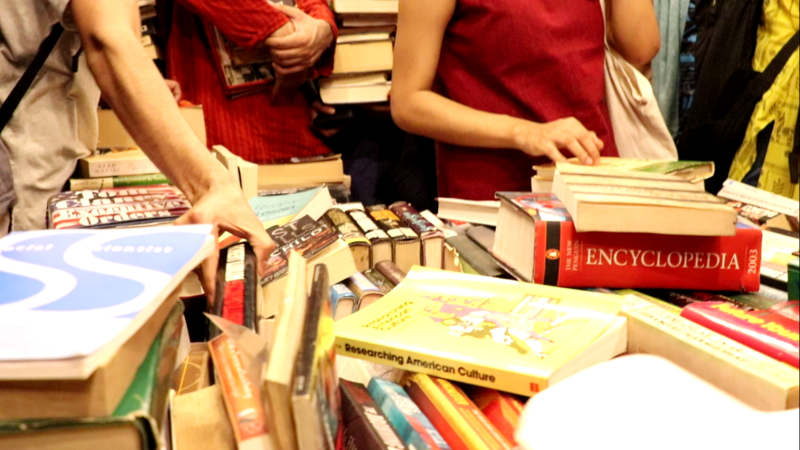 Every year, May Day Bookstore & Café gives a call for volunteers to help them with the event. This year too, they had an excellent team of dedicated volunteers who helped out at the event. In fact, they had been coming for the past 8 days, working every day for 4-6 hours straight, helping prepare for the event. The dedication of the volunteers was apparent. 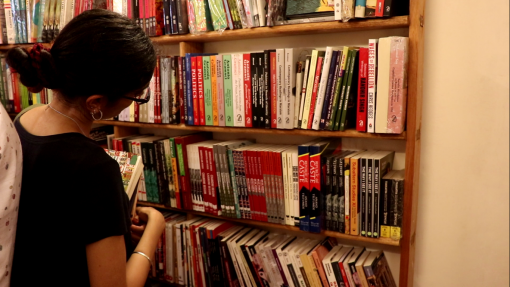 While the visitors had the option of stepping out of the space to get some air (the packed bookstore and studio became quite stuffy quickly, with the tightly packed crowd adding to the general mugginess), the volunteers remained hard at work. Aditi, who was manning the cash counter at the book sale, said that they had already been warned by Deshpande about how hectic it was going to be. “I ended up having to stand for five hours straight while manning the cash counter because there weren’t enough chairs! But it was a good day. 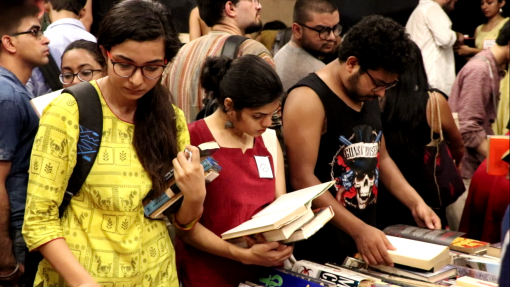 We made Rs 1,59,000 from the second hand book sale. I think that’s about Rs 29,000 more than last year. 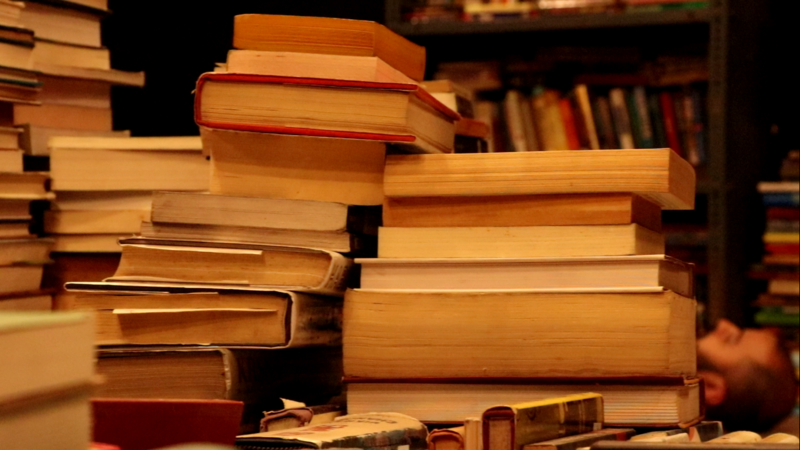 Although the sales from the new books at the bookstore were a little less than last year. 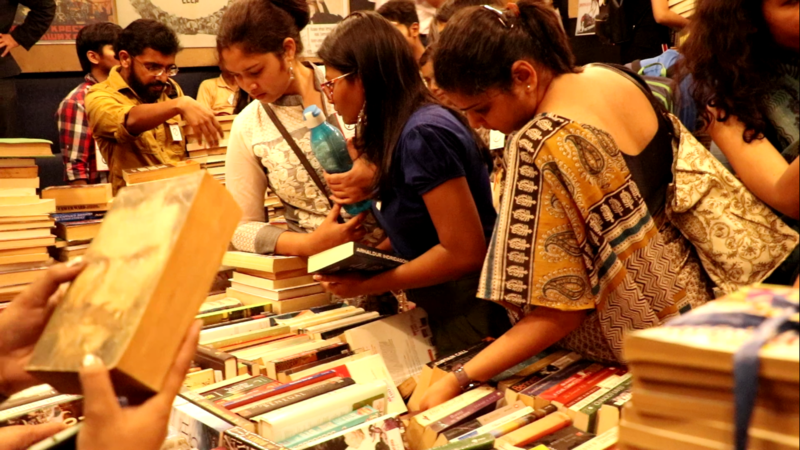 We sold books worth Rs 1,15,000." The rickshaw pullers were of the same opinion. Ghulam Mohammad, who has been plying his rickshaw in the area for some 7-8 years, was quite enthusiastic about the event. “On any given day, we make about Rs 300. Maybe Rs 400, if it’s a good day. But since this place has opened up, every year on 1 May, we make a lot more. I’ve already made around Rs 700.” This was echoed by another rickshaw puller, Mohammad Suleman, who has also been plying his rickshaw here just as long. Unfortunately, though, neither of them seemed to know what the event was about except that there was a book sale. 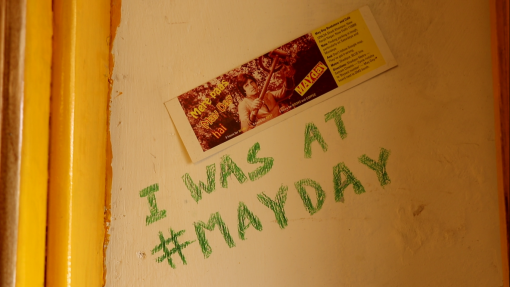 That event saw a 500+ crowd, with the first time visitors out-numbering those who had come for the previous May Day celebrations.